Floor sheathing is one of the most important elements to consider when building a new home. The floor sheathing must withstand constant use and hold up against all types of weather. AdvanTech floor sheathing offers a long-lasting solution that will keep your home sturdy and secure. There are many advantages to choosing AdvanTech floor sheathing. Some of these benefits include moisture resistance, superior strength, durability, and ease of installation. It's no wonder that AdvanTech floor sheathing has been chosen as Builder Magazine's #1 Quality Brand Leader for 10 consecutive years. Southland Custom Homes uses AdvanTech floor sheathing to give our customers a great building experience and a home that provides the safety and comfort they desire. AdvanTech floor sheathing is designed to resist moisture to keep your flooring in great condition. It is made using advanced resin technology to decrease water absorption and edge swell. This means builders will do less sanding during installation. 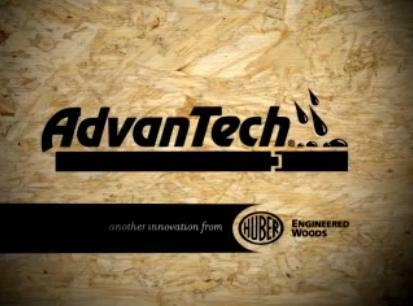 AdvanTech floor sheathing has been proven to work and offers a 300 day no-sand guarantee. It also eliminates expensive repairs and reduces the need to rework materials during construction. Compared to other products, AdvanTech floor sheathing has the lowest percentage of water absorption in the industry. These floor panels are sure to keep your home sturdy and dry for many years. Nobody likes a loud and squeaky floor. Using AdvanTech floor sheathing ensures that your home will have sturdy and quiet floors for years to come. The high density design means that these floors will hold strong under all conditions. With exceptional nail holding power and strength, they are guaranteed to stay in place. Special care is taken during installation to ensure the panels are installed in a flat position to give your home the highest quality floor. AdvanTech floor sheathing is one of the highest performing floor panel options in the business, and is often the first choice of home builders. Installation is quick with AdvanTech floor panels. The moisture resistance and high durability of these floors means less sanding and rework during construction. Floors have to withstand a lot of stress during the building process. Homes can be built faster with AdvanTech floor sheathing because they eliminate the need for repairs later in the process. Builders don't need to worry about water damage and swelling, and can focus on finishing your dream home. Faster drying rates allow for quicker floor finishing to get your home move-in ready. AdvanTech floors are consistently recognized for being the best flooring option available. Not only have they held the title of #1 Quality Brand Leader for 10 consecutive years, but they were also ranked #1 in service by retailers in the NAHB Customer Satisfaction survey. These floors are held to the high standards of Huber Engineered Woods and are expected to perform at the highest level and offer complete customer satisfaction. AdvanTech floor sheathing also offers a 50-year warranty. Customers can have the peace of mind they desire knowing they are standing on floors made by AdvanTech. Sturdy floors are essential to all homes. Buyers want floors that will hold up and stay quiet throughout the life of their home. AdvanTech provides strong, moisture resistant floors that will keep your home dry, quiet and protected from the elements.